The exit polls for Karnataka polls 2018 conducted by different channels predicted a hung assembly. While some polls speculated Congress as the single largest party, others claimed that the BJP will win the largest number of seats. JD-S will remain at the third spot, according to most exit polls. BENGALURU: The counting of votes of Karnataka Assembly elections 2018 is underway amid tight security cover. A neck-and-neck contest is going on between the ruling Congress and Opposition BJP. All eyes are set on this high-pitched polls as the results of it are being touted to be the precursor to the upcoming Lok Sabha polls in 2019, with many predicting the winner of these polls will be the kingmaker. Here are the latest updates for Nelamangala Magadi, Ramanagaram, Kanakapura, Channapatna, Malavalli, Maddur, Melukote, Mandya, Shrirangapattana, Nagamangala, Krishnarajapete, Shravanabelagola, Arsikere and Belur. A single-phase polling was held in 222 constituencies out of the 224 elected seats in the Assembly, including 36 reserved for the Scheduled Castes (SC) and 15 for the Scheduled Tribes (ST). The polling in Karnataka was held on May 12 with 4.94 crore voters exercising their franchise to decide the fates of over 2600 candidates, contesting from 222 assembly seats. The overall voter turnout recorded was 72.13 per cent. While the Siddaramaiah-led ruling Congress is confident of restoring power for a second consecutive term, the Opposition BJP is eyeing to spread its wings on the 22nd state. The 224-member Assembly expires on May 28 in the state where the Congress is currently in power, with 122 seats against the BJP's 43. Karnataka is one of the eight states where polls were scheduled this year. Now it is to see if the Congress can restore power or the Narendra Modi-powered BJP will foil its plan and make a comeback with BS Yeddyurappa at the helm in Karnataka. A neck-and-neck fight is on in Karnataka with the BJP leading on 93 seats, Congress on 91 seats and JDS on 26 seats. 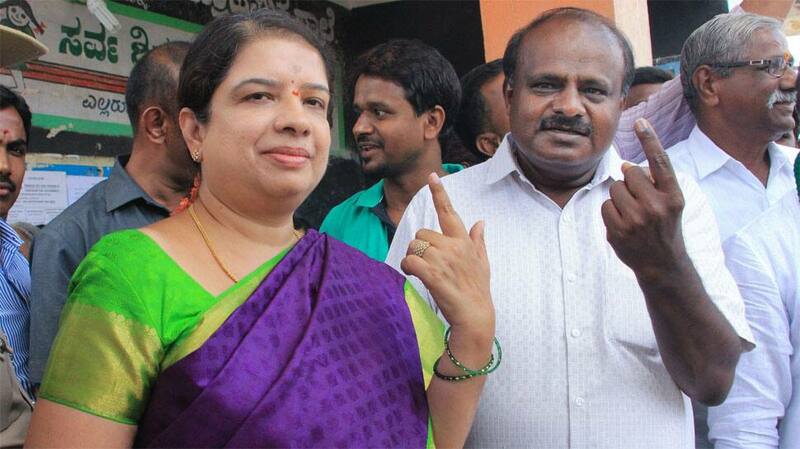 BJP's H D Kumaraswamy leading over the Congress candidate by 1552 votes in Ramanagara. The voter turnout which was recorded 72.13 per cent is the highest in the Karnataka Assembly elections since the 1952 state polls. Trends coming in which says BJP is leading with 70 seats, Congress a close second with 68 seats while JDS standing third with 26 seats and others 1 seat. The counting of votes has begun at 38 centres across Karnataka. Nearly five crore voters have exercised their franchise to decide the fates of more than 2600 candidates. The counting of votes has begun at 38 centres across Karnataka. Nearly five crore voters have exercised their franchise to decide the fates of over 2600 candidates.